Genuine top grain leather with smooth side inside and textured side outside to create a unique look. 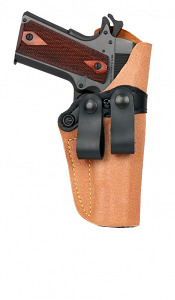 Leather straps stabilize the holster and provide for more stability than a clip on holster. Additional features include a tensioning screw to adjust for retention, reinforcing band to keep holster open when drawing or re-holstering, and the ability to swivel the holster for maximum comfort whether worn strong side or cross draw. Fits Glock 17, 22, and 31.